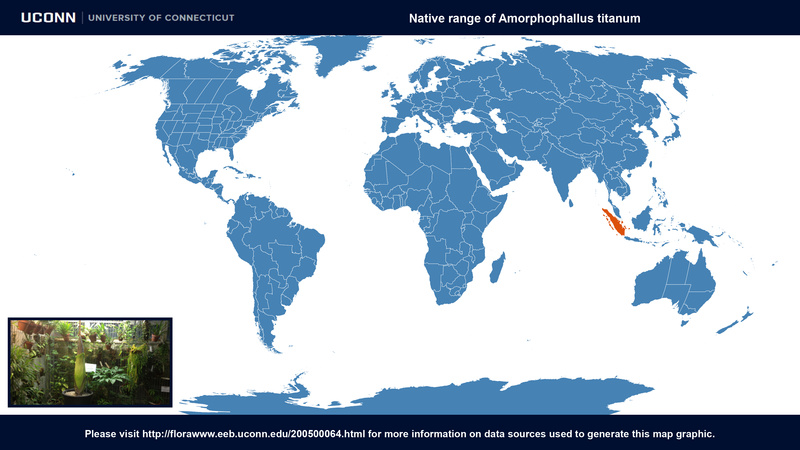 Description: Amorphophallus titanum, the titan arum, is a cormous plant endemic to western Sumatra, where it grows in openings in rainforest on limestone hills. 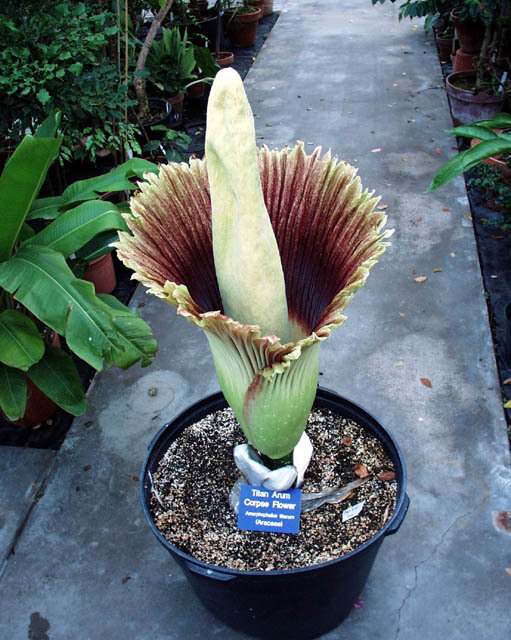 Locals know it by the more evocative name 'corpse flower' (bunga bangkai), because of the hideous stench the fly-pollinated inflorescences produce. Mature corms of A. titanum typically weigh between 25 and 50 kg, with weights up to 75 kg recorded. Corms produce solitary, highly dissected leaves over 3 m high and 4 m across. Leaves persist for ca. 1-2 years. The plant enters a dormant phase of several months after a leaf senesces, before sending up a replacement leaf and growing a new root system. Leaves are hysteranthous: flowers are borne by otherwise dormant plants. The timing of dormancy and growth phases seems to be more or less random with respect to the seasons; wild populations are reported to have plants in various stages of growth at any given time. 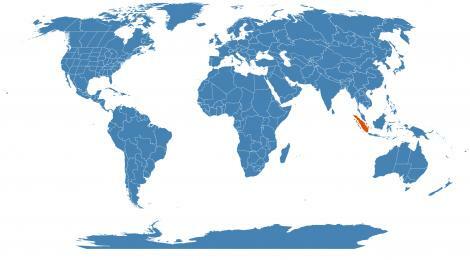 It is unclear why the plants ever go dormant at all, given their equatorial habitat. 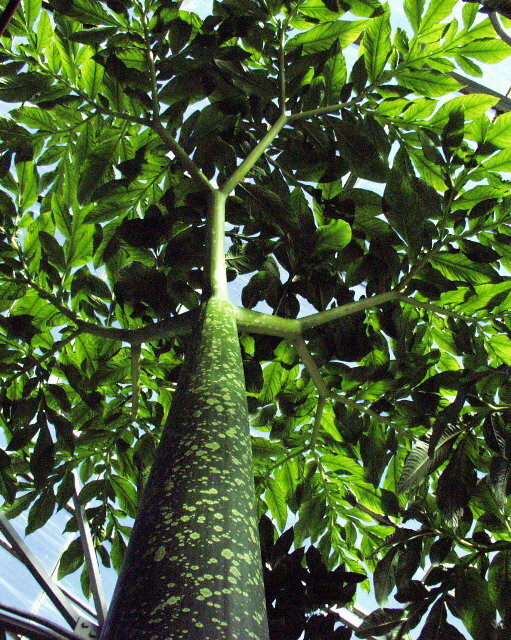 Flower buds emerge shortly after corms become dormant, and are accompanied by the development of a limited root system, unlike the flowers of temperate Amorphophallus species. 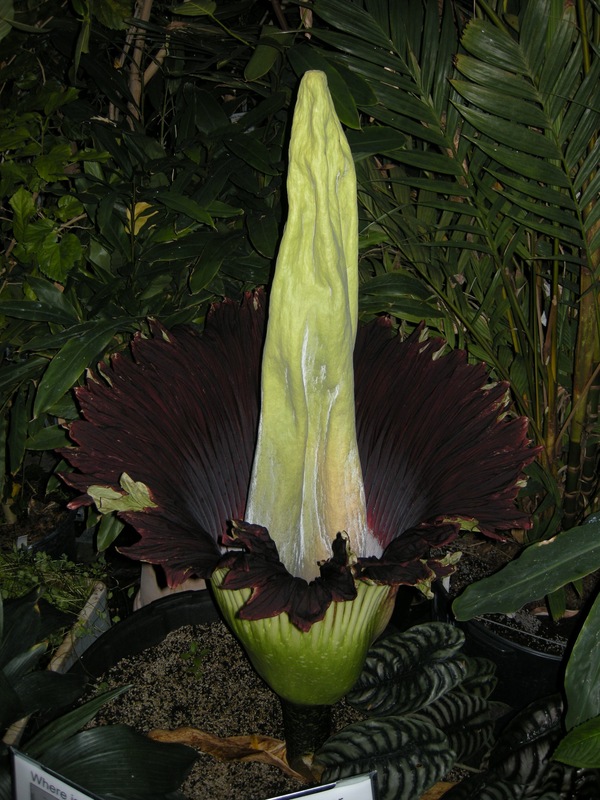 Inflorescences consist of a fluted spathe (petal-like leaf) with a meat-like purple interior, and a sickly-yellow spadix (central stem bearing many small male and female flowers). 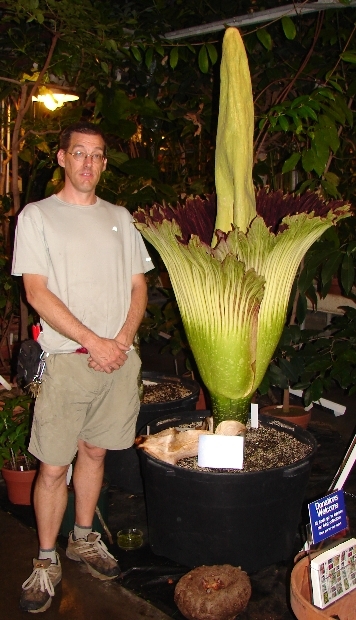 While technically not single flowers, the inflorescences of A. titanum are the largest flower-like structures in the plant kingdom, often reaching 2 m high and 1 m in diameter, or larger. 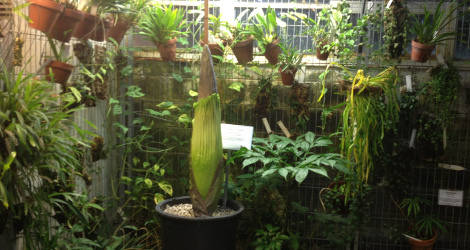 While open, the spadix warms itself with metabolic heat, in what is perhaps an adaptation to volatilize and disperse its carrion-insect-attracting odor. 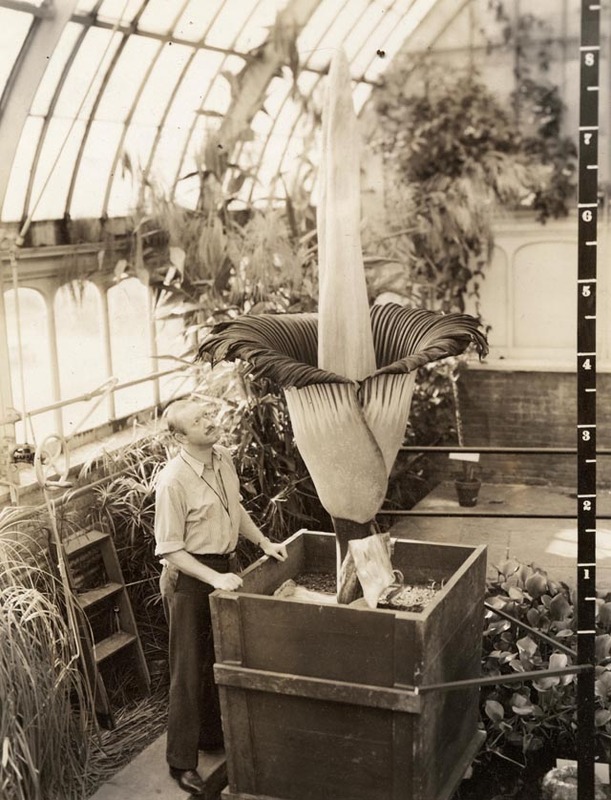 The putrid smell of the corpse flower is strongest just after the spathe unfurls, late at night, suggesting pollination by nocturnal flies and beetles. 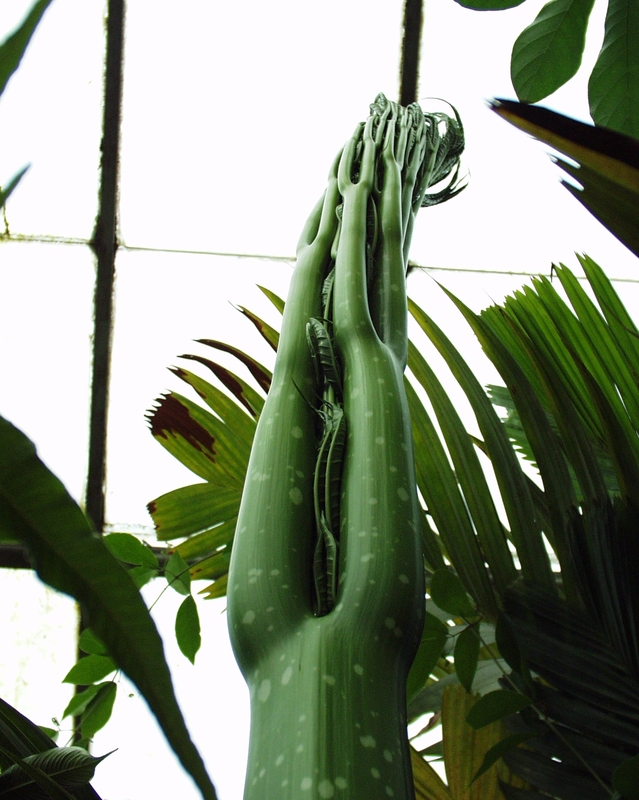 Culture: Corpse flowers require warm temperatures, high humidity, and bright light, with some shade in summer. Plants appreciate fairly heavy fertilization. The soil should be kept moist at all times, even during dormancy. Propagation is apparently possible with leaf and tuber cuttings, though we have not had much luck. 2nd Generation seedlings - maternal parent was one of original UConn plants from accession 199500115 given to UCSB at AERGC meeting in 1995. This plant was named 'Tiny' at UCSB and bloomed 15AUG2002 and seed was collected 03MAR2003 and planted 05MAY2003. 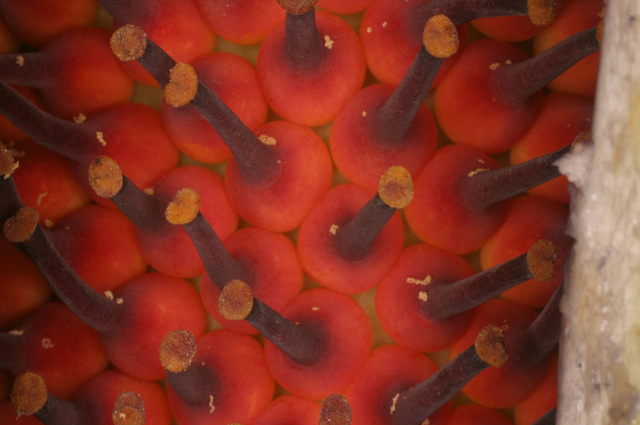 'Tiny' was pollinated with pollen from the Huntington Botanic Gardens. Hortus Third, LH Bailey Hortorium, 1976 Bown, D. 1988. Aroids: Plants of the Arum Family. Timber Press, Portland, Or. Pickrell, J. 2003.